Pundits like to complain that there are few voices from the Islamic world that condemn terrorist attacks by Islamic extremists. I run a small business that distributes editorial cartoons from around the world. With every major attack, including the recent attacks in Paris, I see a chorus of cartoons from Arab countries condemning the terror. The pundits must not be looking at the cartoons. 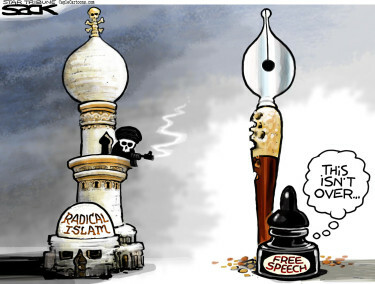 Editorial cartoonists are typically the most influential voices in newspapers throughout the Middle East, reflecting the views of their readers. Newspapers remain important in everyday life in the Middle East. Editorial cartoons grace the front pages throughout the Middle East. Arabic language cartoonists are typically anti-American and anti-Semitic, but on issues of terrorism they are largely voices of reason.